BOTSWANA AGATE pendant set in Silver with a 4.9mm Plum Purple Spinel .60 carats. This is an amazing piece; the photography doesn’t do it justice. The Agate has a little more plum in it than shown here. 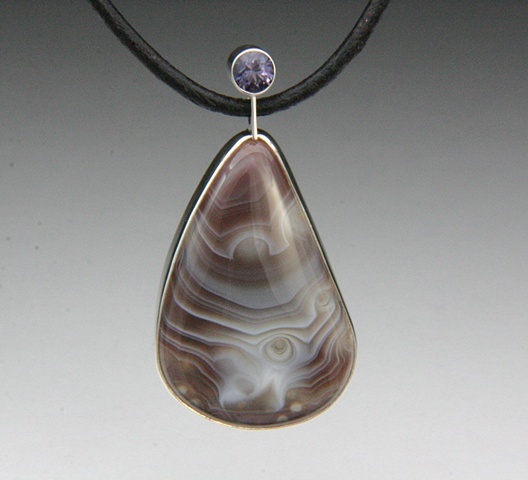 Botswana agate is a purplish-gray fortification gemstone exhibiting white patterns of, usually, circles or ovoids. Also known as the eye agate has been known to ward off the evil eye. Legends abound about Botswana agate. It is said to be used to stimulate the exploration of the unknown and to further one’s quest towards the enlightened state. It also is used for protection, fertility, sensuality, sexuality, passion, artistic expression and emotional comfort. Botswana agate stimulates the crown chakra, encouraging eternal love and allowing for the recognition that eternal love is a constant in the ever-changing universe. I’m not sure about the above statement, but it is a stunning example of a very high quality Botswana Agate and you will get a lot of complements while wearing it. #JC296 - Signed by Jewels Curnow.